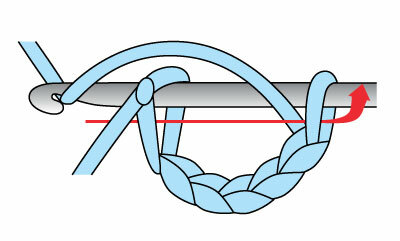 Crochet symbols are a universal language that allow an alternative way of reading patterns. 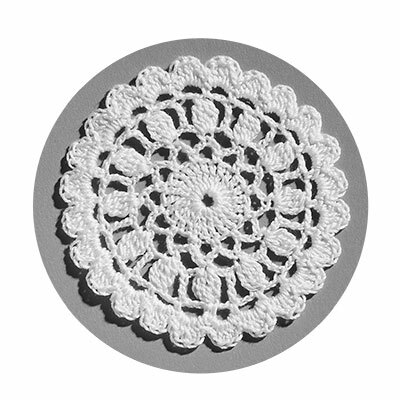 In symbol crochet, each stitch is represented by a little picture or symbol. 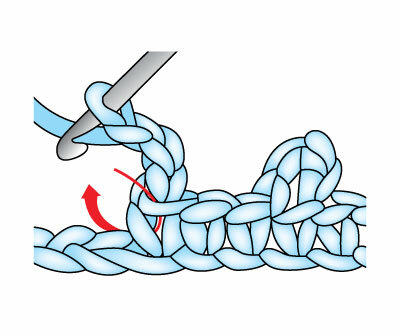 or represents a chain (ch) -- and resembles a chain stitch. 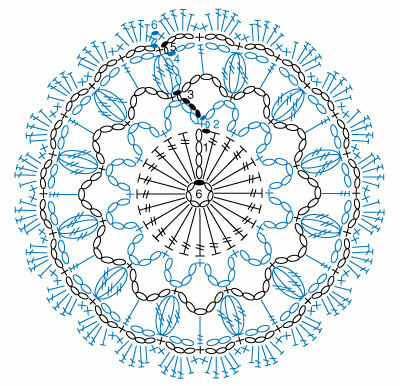 represents a single crochet (sc). represents a half double crochet (hdc). 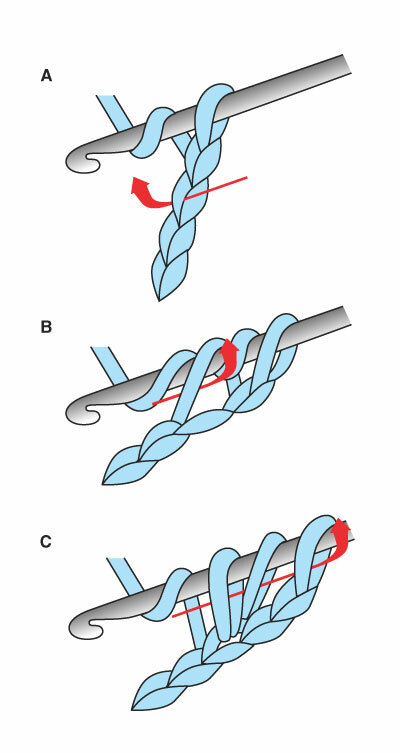 represents a double crochet (dc). 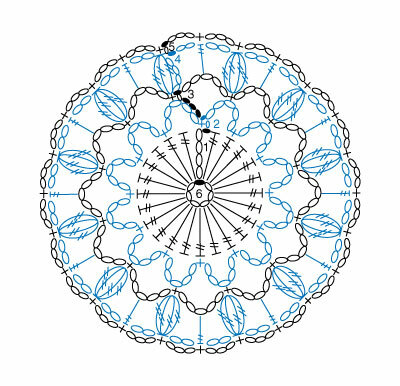 represents a treble crochet (tr). 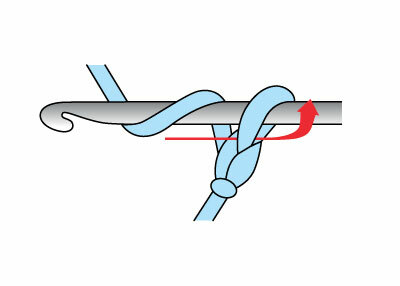 represents a slip stitch (sl st)—this symbol resembles the chain symbol, but is filled in. 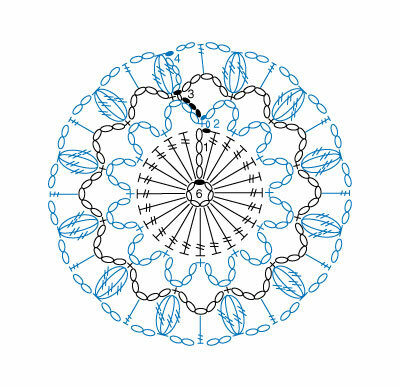 represents a 4-treble crochet cluster (4-tr cl). These are the basic symbols we will use in the Melody Mini Doily practice project. 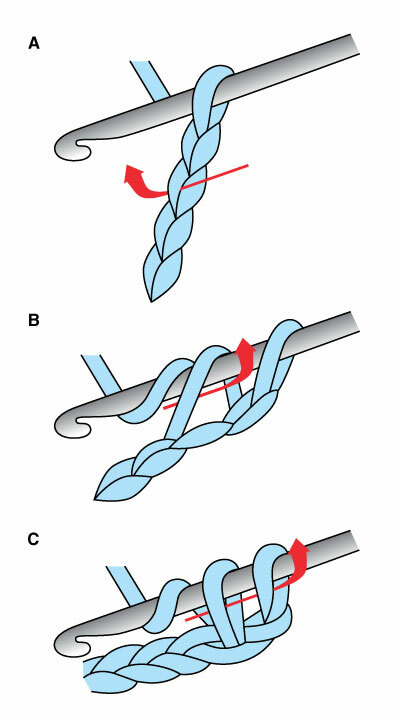 Sometimes there is a special symbol for a group of stitches, such as a bobble or a popcorn; these symbols are given either with the pattern or are included in a stitch glossary. A glossary of all symbols used in this article is below. When symbols are arranged to form a "picture" of the work to be done, it is called a diagram. 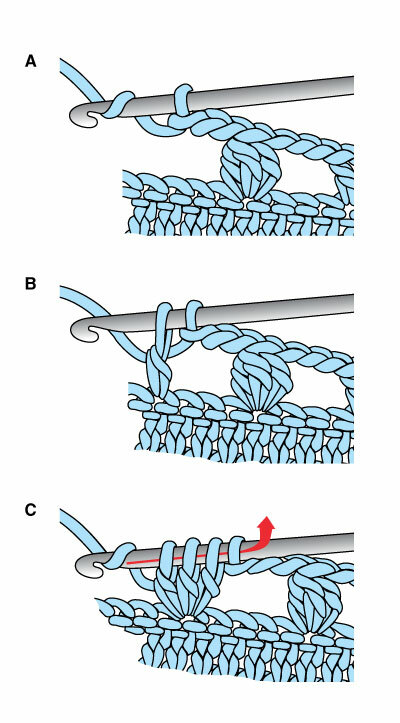 The diagram looks quite similar to the finished crocheted piece and shows at a glance just how it is constructed. 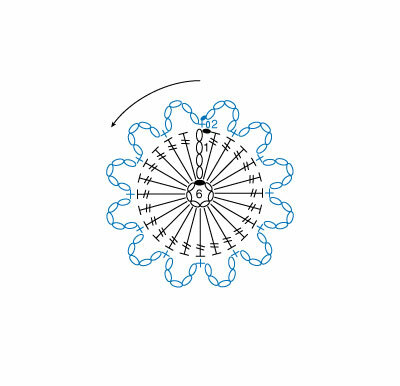 On circular designs, such as doilies, the diagram is followed starting at the center, working from right to left (counterclockwise) if you are right-handed and from left to right (clockwise) if you are left-handed. 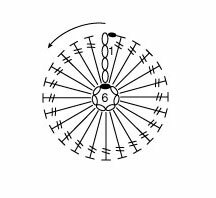 The number 6 in the center of the ring shows the number of chains needed to start; the symbol for slip stitch indicates joining in a ring. The number of the round is indicated at beginning of the round. 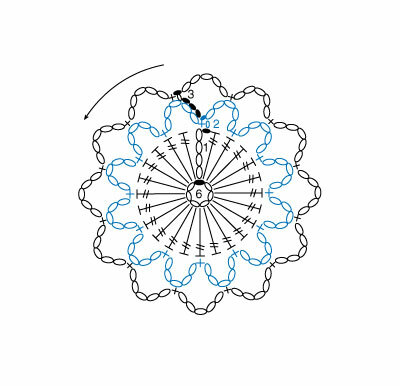 This mini doily practice piece will let you practice following the symbols and show how a diagram is made. Below, you will find the symbols that tell you what to work for each row. Below each illustration, the instructions for the symbol diagrams are written out in words. First try to work from the symbols, then check your work against the words. Ch 6, sl st in first ch to form ring. Rnd 3: Sl st in each of next 3 chs, ch 1, sc in same ch as last sl st, ch 5, [sc in 3rd ch of next ch-5 sp, ch 5] 11 times, join with sl st in beg sc. Rnd 4: Ch 4, keeping last lp of each tr on hook, 3 tr in same sc, yo and pull through all 4 lps on hook (beg cl), ch 2, tr in 3rd ch of next ch-5 sp, ch 2, keeping last lp of each tr on hook, 4 tr in next sc, yo and pull through all lps on hook (cl), ch 2, *tr in 3rd ch of next ch-5 sp, ch 2, cl in next sc, ch 2, rep from * 9 times, tr in 3rd ch of next ch-5 sp, ch 2, join with sl st in top of beg cl. Rnd 6: Sl st in next ch-3 sp, ch 1, (sc, hdc, 3 dc, hdc, sc) in same ch sp and in each ch-3 sp around, join with sl st in beg sc. Fasten off. 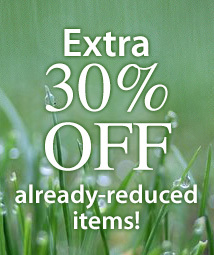 Secure ends.